Teva says:"The Omnium Men's Sport Sandal is versatile enough for all of your adventures, as it provides additional coverage for protection, quick-drying materials to keep you comfortable and Teva-tested Spider Rubber® to keep you on your feet. 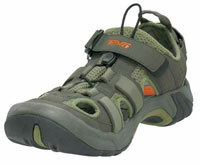 This shoe is great for water activities such as canoeing, river rafting, sit on top kayaking, and amphibious hiking." The Omnium were certainly very comfortable straight out of the box and remained so throughout a number of short (1-2 miles) walks on both wet and dry asphalt and sandy pathways. The fit is generous (my normal shoe-size is UK 10.5, but the test pair were a UK size 10) and there are a number of options for customising them - the ankle strap, the top of foot lacing and at the back of the heel. So it really was easy to get a snug fit. The inner sole is well padded and the foot bed provided a very good level of arch support. There was good traction on both the dry and wet surfaces I tried them out on. The covered design meant that I could use my right-shoe orthotic which for me was a huge advantage over a more conventional sandal design. I could also wear them with socks - which as I was testing these in an early UK Spring was also rather convenient! So far the anti-microbial protection has worked in that I've not experienced any odour - however, the cooler test temperatures may have helped with this. More on this as the summer progresses . . . . I'm usually wary of wearing sandals when cycling - but I would be happy with these for leisure/commuter cycling as well. If you're looking for footwear with the flexibility of a sandal but with some additional toe and heel protection, then do consider the Omnium. They are a great option for crossing streams and shallow rivers when you need good quality, lightweight footwear that will keep out debris, provide good traction and will dry quickly.